Indiana became a state December 11, 1816, the 19th state admitted to the Union. On June 7, 1820, ten Indiana commissioners chose an area of rolling woodlands in the center of the state to be the new capital. Only two white settlers lived there at the time, among scattered Indian villages. The city was laid out in a wheel pattern, like Washington, DC. The capitol is built of Indiana limestone, with a copper-covered dome. It is 235 feet to the top of the cupola. 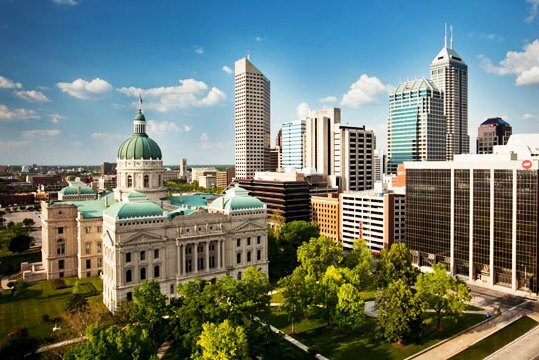 Indianapolis is the largest city in the state today. In historic Lockerbie Square, you can visit the home of James Whitcomb Riley, who was known as the Hoosier Poet. On Delaware Street, you can visit the home of Benjamin Harrison, 23rd President of the United States. The Indy 500 races are held at the Indianapolis Motor Speedway every Memorial Day. A month-long celebration precedes the event, with the Queen’s Ball, Mechanic’s Recognition Party, and a big parade. The monument circle that centers the city; the capitol right there within reach; enough places to park, and sit, and walk, and run; enjoy the moments, the lunchtime music in the garden built above the street; so down to earth; so downtown Charlie Brown. Mountains near: Dearborn Uplands. Hoosier Hill, in the east central part of the state, is the highest point in Indiana at 1,257 feet.